Due to the incredible success of our program and the continuing needs of this mission, we closed the kitchen in order to completely renovate the facility. Our target reopening is Fall 2018 (official date to be announced). Thank you for your patience while we work to improve this outreach which is so critical to the well being of many in the Plainfields. Many individuals and families in Plainfield have been hit particularly hard financially. The numbers of those who are on the streets or living in shelters is on the rise. People are left hungry but thanks to the generosity of the Keyes Foundation, other generous donors and dedicated volunteers, fewer are hungry and hope is found here once again. 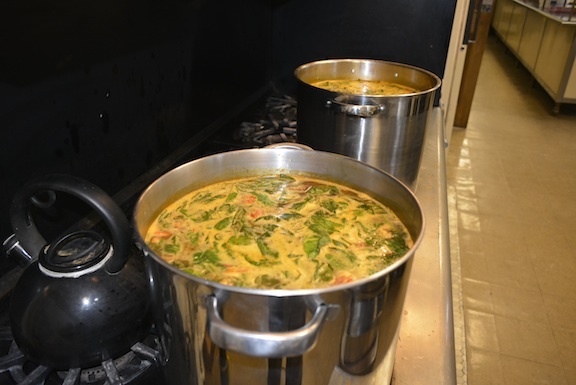 On Tuesdays, a full lunch is served beginning at noon under the auspices of the Crescent Avenue Presbyterian Church's Soup Kitchen (CAPC Soup Kitchen) in Plainfield, NJ. 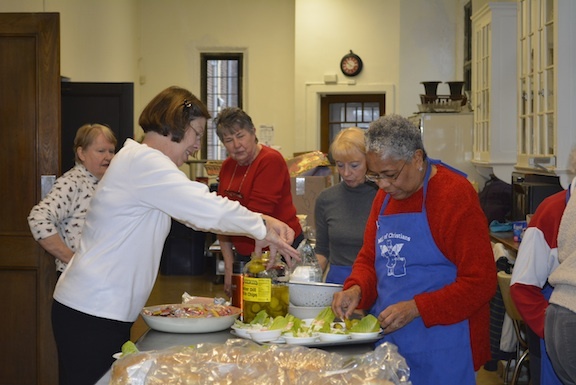 Volunteers gather at 9 a.m. to begin preparations and ensure all is ready for the lunch guests. Church groups and other volunteer organizations are welcomed to come and help with the preparation and serving! Quoted as being 'The Olive Garden of Plainfield' the CAPC Soup Kitchen is open to all and exists completely on the gifts of others. Costco donates food goods as well. 100% of donations goes directly towards foodstuffs. Ministry doesn't get any more real than this. Serving those who are hungry, opening the doors to the community and reaching out with compassion and in service, as one volunteer quipped, "I feel guilty having so much fun doing this, it doesn't feel like work!" Looking for Ways to Volunteer for CAPC Soup Kitchen? Come and work as a volunteer (no experience necessary). Register online or call us at (908) 756-2468 to let the Soup Kitchen Team know you would like to help. Bring your church group or other team (Minors must be accompanied by guardian/parent/authorized adult) that would like to do hands-on mission work. This is a great way to serve and let others know you want to make a difference. Make a donation (100% of your gift towards directly to the purchase of foods and supplies for those in need). Can't be here in person? We are happy to distribute toiletry kits and special gifts to those in need (in your name). Simply contact the church office to let us know what you would like to have distributed and we will make arrangements for their distribution. Want to volunteer or learn more?